Maximiser le temps passé en Italie avec une excursion à Venise depuis Rome via le train à grande vitesse. Naviguez sur le Grand Canal sur un bateau-taxi et utilisez les tickets d'accès prioritaire pour passer la ligne à la basilique Saint-Marc. Montez sur les terrasses de l'église pour une vue panoramique sur la place Saint-Marc. Terminez la journée par une visite guidée à pied comprenant des attractions telles que le pont du Rialto et le pont des soupirs. Fantastic tour of Venice, definitely doable from Rome in 1 day. High speed train got us Venice in the morning with plenty of time to spend the day there. Wonderful tour guide Paola took our small group of 3 under her wing and gave us a very personal walking tour of the city off the beaten path. Skipped the line at St Marks and got a wonderful ride down the Grand Canal. Train got us back to Rome by 9 pm. Fantastic day trip. This was a tough one for us to rate. We went into this tour with the mindset that this was the only practical way we were going to see Venice on a day trip from our Rome based vacation. You need to realize that you will be spending 8 hours of the day on a train I've seen a lot of people say it was 3 or 31/2 but the ride took us a solid 4 hours each way as we had about 5 or 6 stops along the route but we knew this going in and did not rate the tour low because of that. We got to meeting point which was stated as the park across the Train Terminal at 6:15, it was dark and raining and there was no one in sight. As it approached 6:30 we began to get nervous and called the emergency number only to get a recording that they were not open so no help there. We started to wonder around and thankfully stumbled upon the guide whom was at the train station already, not waiting for us in the park. We made the assumption that we would be guided throughout the whole experience so we were shocked when we were handed a train ticket and told which car to climb aboard where we were by ourselves the next 4 hours. Once in Venice, we were met by a lady whom took us via water taxi to the Rialto Bridge to meet our guide. This guide was a local Venetian and although I think she was trying to give us an experience from the perspective of a local Venetian it came across like she didn't like tourists very much and we encountered a few uncomfortable moments when she made comments criticizing other tourist loud enough for them to hear. This tour only last two hours and ended at St. Mark's where we did get to go to the terraces which was awesome and you do get a view of inside the church from above but were told that going into St Mark's itself on the ground floor was not included. You had the option of waiting on another line if you wanted to go it was free though. Shortly after 1PM, you are left on your own for the rest of the afternoon to do what you want and that is the last person of this tour that you are going to see. It is up to you to get your way back on the water taxi and on the correct train. 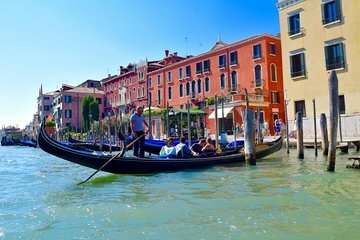 This was a hard review because aside from the few issues, we really had a great time in Venice and glad we went but was left disappointed because I have no idea where in the world this tour company gets off charging these prices for a train ticket, water taxi ticket and a 2 hour guided tour?!?!?! ?